Aero Snap is one of the best Aesthetic features in Windows 7, if you haven’t heard of it; Snap is a quick new way to resize open windows, simply by dragging them to the edges of your screen. This can be a time saver, included with this is the Aero Shake feature which helps you close all the windows except the one you are working on by just shaking the active window. If you’ve been using XP/Vista these features won’t be available unless you install 3rd Party Apps. In this post, I am going to guide you towards getting these features on your XP/Vista machine. 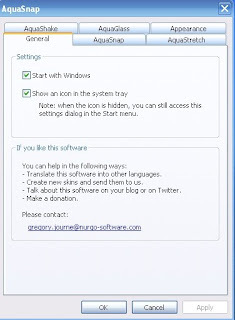 Start by downloading Aqua Snap which is free software that helps you get these features to your computer. After installation, you will find an AquaSnap Icon in the system notifications tray, clicking on it will enable you to see the AquaSnap console where you can change the settings, etc. Aqua Glass is disabled by default, if you’ve got a computer will a decent amount of memory, you might want to enable this. Aqua Shake, Aqua Strech are the other features provided. The screenshots below will give you a fair idea about how this program works. If you are looking for a demo, check out this YouTube video.